It was all fun and games Wednesday night at the Mattamy Athletic Centre at the Gardens in Toronto, Ontario, as two teams captained by P.K. Subban and Steven Stamkos took the ice for just over 2,600 cheering fans. 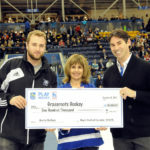 The RBC Play Hockey Charity Challenge featured 39 current NHL players, celebrity coaches Rob Zamuner and Eric Lindros for Team Subban and Mathieu Schneider and Jim Cuddy of Blue Rodeo for Team Stamkos, and Ryerson’s own, Louie George, who got some time between the pipes for Team Subban. P.K. Subban and Steven Stamkos are ambassadors for the Royal Bank, so, without any hesitation, they put together two teams of current NHL stars to represent their teams in a charity hockey game that raised $100,000 towards grassroots hockey initiatives. “These types of events are not about getting paid. Steven Stamkos and myself are ambassadors for the Royal Bank, but I mean putting 40 guys together has nothing to do with money, it’s much more than that, it’s about giving back to our fans who allow us to do this for a living,“ said Canadiens defenseman P.K. Subban. “I don’t think you ever plan these things ahead of time, it’s one of those things that just come about. I would love to do another event; they’re very fun to do,” he continued. With ticket prices being at a league high in Toronto, sometimes it’s not easy for everyone to attend a game at the Air Canada Centre. With an event like this, fans from all over were able to take in a game full of NHL players at an affordable price. While other players like Brad Boyes enjoy charity events like these so they can catch up with old friends, they understand that the ultimate goal of something like this is to put on a show for the fans that support them on a daily basis and to raise money for charity. As someone who hails from Mississauga, Ontario, and was once a member of the Toronto Maple Leafs, Boyes knows that seeing a Leafs game live isn’t as easy as it sounds. This isn’t the first charity game that the NHLPA has been a part of and it definitely won’t be their last. There may be no NHL games on the schedule right now, but lockout or not, they will continue to raise money for various charities and causes. “Well it’s great that the fans showed up for a great cause because this is an opportunity for us to raise a lot of money for a great charity,” explained Buffalo Sabres centre Steve Ott. Steven Stamkos, whose team came out victorious, was very happy to see the turnout, especially after playing in his second charity game in less than a month. “It was outstanding to see the turnout because obviously the fans are hurting through this process,” said the Markham, Ontario native Steven Stamkos. “I’ve had the opportunity to play in two charity games. The Hurricane Sandy Relief one in Atlantic City had a great turnout. It was a big venue and we sold that out,” the two-time Maurice “Rocket” Richard Trophy winner continued. With the teams already stacked on both sides, there could have been more locked-out NHLers involved in the action if it was possible. “There were guys calling in, calling me, who wanted to play tonight. They probably turned away 20 guys who were interested,” explained Leafs winger Joffrey Lupul. Steve Ott was one of the lucky ones to get a call and dropped his plans as soon as he was asked to participate in the event. With plenty of guys being left to nothing but pickup games a few times a week, an organized game is a change of pace for them and something they all enjoy. “It was great to play an organized game. It’s been a long time off and tonight we were all here for a good cause and I think it’s great that this game was put on and the turnout from the fans was great and it was a lot of fun to be a part of,” stated Leafs captain Dion Phaneuf. Although the NHL is in the midst of a lockout, the fans were still out in full force to support the players and the cause that they were helping. With support like that, the players understand how important the fans are to them and the game of hockey. Hopefully this wasn’t the last time you will see an NHL player in a game in Toronto until next season, but it certainly won’t be the last time you will see them taking part in a charity game or event for that matter.